About two to three feet of fresh snow has been recorded at the upper reaches of Kashmir. Hundreds of passengers were stranded as all flights to Srinagar were cancelled for the second consecutive day on Thursday due to heavy snowfall. The strategic, 300 km Jammu—Srinagar Highway, also remained closed for vehicular traffic due to snow and landslides. 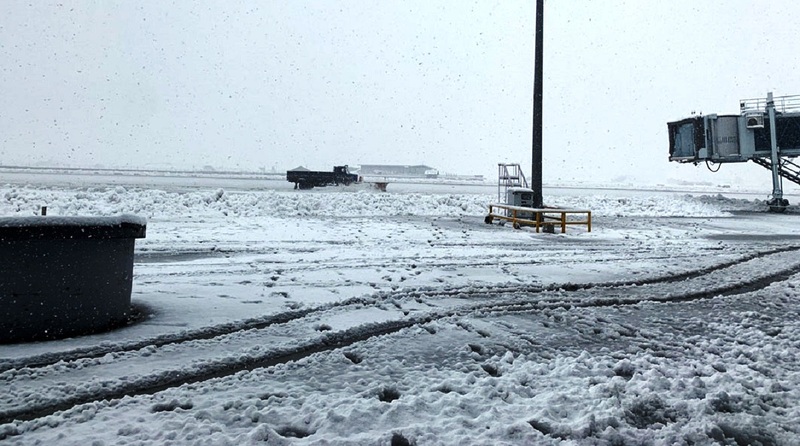 The runway of the Srinagar Airport was buried under a thick sheet of snow as a result of which all 27 flights of various airlines were cancelled. The helicopter service at the Vaishno Devi shrine in Jammu has also been suspended due to rain and poor visibility as a result of which several pilgrims were stranded. The Kashmir valley, Ladakh, and the upper areas of Jammu were receiving continuous snowfall since Wednesday. The plains of Jammu were witnessing widespread heavy rain as a result of which several roads have been closed due to landslides. Electricity and water supplies have been hit due to bad weather. Several areas of the Kashmir valley, and also in Jammu, were without electricity supply as the transmission lines have snapped. An under-construction electric tower collapsed in the Bandipura district. Men of the Border Roads Organisation (BRO) were engaged in clearing landslides from the highway, while PWD and other agencies were removing snow in the cities and towns. The temperature has dipped in the state due to snow and rain. The J&K Traffic Police announced that any decision to restore the movement of traffic on the Jammu—Srinagar Highway will be taken on Friday depending on the condition of the road. No traffic was being allowed due to snow accumulation on both sides of the Jawahar Tunnel and landslides and shooting stones at several places.